A FATHER and son who appeared before a Chaguanas magistrate today charged with having five scarlet ibises’ carcasses have been debarred from entering the Caroni Swamp, home of the protected species. Magistrate Christine Charles placed the ban on Indaraj Mahabir, 50, and his son Kimraj, 29, as a condition to the $90,000 bail she granted to each of them. In explaining the conditions, the magistrate said the accused men should not cross an area called "number nine" and the Blue River north of the swamp. They must also not cross Madame Español River, also called the Cunupia River in the south, the Gulf of Paria in the west and the Uriah Butler Highway in the east, excluding private lands. Charles, who presided in the first court, also ordered that the father and son may not apply for any permits from the Forestry Division to allow them to enter the protected area legally. Mahabir and Kimraj were jointly charged with five counts of having the birds, which are an environmentally sensitive species, on Sunday at the Caroni Swamp. These charges were contrary to the Environmental Management Act Chapter 35:05. The charges were laid indictably so they were not called upon to plead. The men were also charged with two counts of hunting iguana on state lands, allegedly on Saturday and Sunday at the Caroni Swamp. The charges were contrary to the Conservation of Wild Life Act Chapter 67: 01. They pleaded not guilty to these two charges. 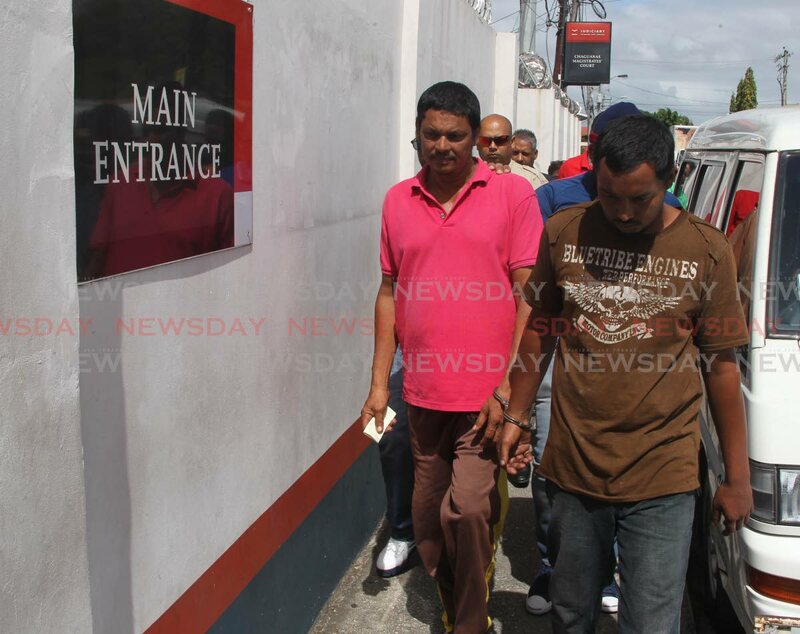 Game wardens Richard Ramlogan and Nicholas Leith laid the charges. The game wardens showed the court the carcasses of the birds and eight iguanas, which were inside two coolers. Attorney Taradath Singh represented the accused men, saying his clients had no previous convictions or pending matters. Mahabir is the grandfather of four. Kimraj, who is self-employed, is the father of three. They live at Warren Road, Bejucal in Chaguanas. For allegedly hunting on state land, the magistrate granted them each $5,000 own bail and transferred the matter to the second court. For allegedly having the carcasses of the scarlet ibis, she granted them the $90,000 bail to be approved by a clerk of the peace and a cash alternative of $25,000. Ag Insp Wayne Waithe prosecuted. The men are to return to court on December 21. The maximum fine is $100,000 for each bird, with the possibility of up to two years' imprisonment. Agriculture Minister Clarence Rambharat attended the court earlier in the day, but by the time the case was called at about 2.35, he had left. Reply to "Accused ibis poachers banned from Caroni Swamp"